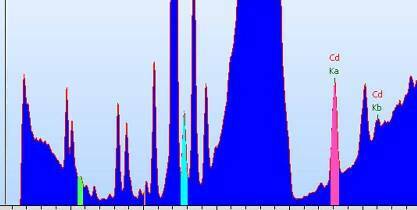 A popular application of Quickshot XRF analyzers is RoHS screening (important to note that they are used as a ‘screening’ device) and one question that comes up from time to time is about the potential of overlapping spectral peaks. It is possible that an XRF analyzer will have two elemental peaks that overlap and this may result in mis-identification of the elements of interest. However, these situations can easily be remedied with x-ray fluorescence systems like the desktop QSX-82D and some experience. As shown in Image 1 (below), each element shows a K-alpha and K-beta spectral line with ED-XRF technology (highlighted here by Cadmium Ka and Kb). When results are questionable, or when testing a sample for the first time, we would suggest the operator evaluate the spectrum of the sample. The problem would be obvious and the operator can simply change one of the elements identifying energy lines to K beta and the second to K alpha. Of course, a system with improved detector tube performance and resolution capabilities will be able to identify more defined spectral peaks (read SiPIN vs SDD). This will make it a more straightforward task for the system, and operator, to appropriately identify elements because spectrums that overlap with one detector may not with another detector. This is a quick summary but the approach would result in proper identification and greater assurance of elements present. The Quickshot XRF desktop analyzer for RoHS testing shows the spectrums color coded and marked on the main screen. If an XRF system doesn’t, then you should re-evaluate the analyzers that you are considering for RoHS screening. Have a question about XRF Technology? Contact a Quickshot XRF associate to discuss the question and answer!